Dual Layer Tread (Available in P-Metric Sizes). Minimizes the effect of wear on wet tire performance by exposing high grip rubber as the tire wears. DuraTech (available in LT-Metric and flotation sizes). High durability compound that minimizes chipping and tearing of the tread to stand up to demanding applications. Semi-Stealth Blocks. Promote higher tread stiffness for improved handling while enhancing water evacuation. Stepped Inside Notch & Saw Tooth Grooves. Contribute to snow traction. Open Shoulder Tread Design. Helps evacuate water and improves wet traction and handling. Minimizes the effect of wear on wet tire performance by exposing high grip rubber as the tire wears. High durability compound minimizes chipping and tearing of the tread to stand up to demanding applications. Promotes higher tread stiffness for improved handling while enhancing water evacuation. Helps evacuate water and improves wet traction and handling. "Improved rolling resistance which helps increase fuel efficiency and reduce vehicle emissions. 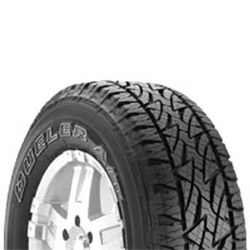 (As compared to the Bridgestone Dueler A/T Revo (SIze: P265/70R17. Actual results may vary based on proper tire maintenance, vehicle, tire life, driving style and road conditions.) Longer lasting tread, which increases tire life and conserves resources. Environmentally advanced materials, such as low-aromatic oil, silica technology, and recycled materials."